Kids bring so much joy to our life. They deserve only the best quality products, and you can deliver them globally via this wonderful store. A playful background pattern suits the main idea of the theme. Logo has a simple colorful design that is easy to remember. Rainbow menu has a drop down option. Smiling children in the slider and on banners look really cute. 'Add to cart' button appears on hovering 'Featured products'. The footer is rather informative. So, make a small investment now and get your profit in the nearest future. The theme is very well done and detailed, although I had to make a little css tweak to padding on the front page. Suggested! Hello, did anybody try to install this theme on a Prestashop 1.6.X engine ? Any feedback on this topic ? Thanks ! 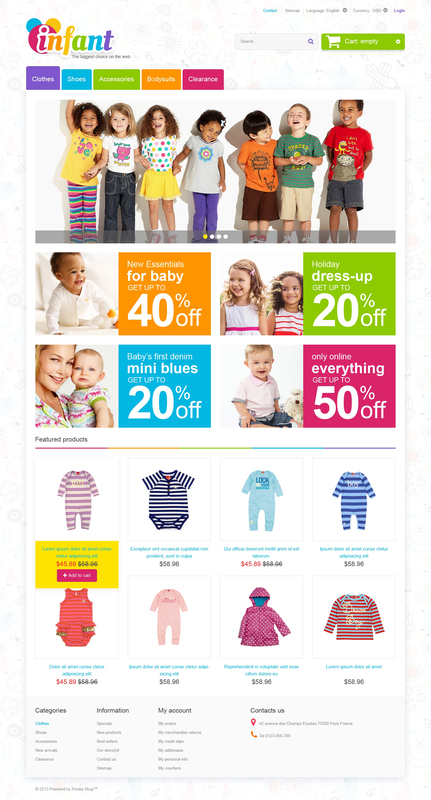 This PrestaShop theme is best suited for children, baby clothes, infant stuff, and gifts stores.